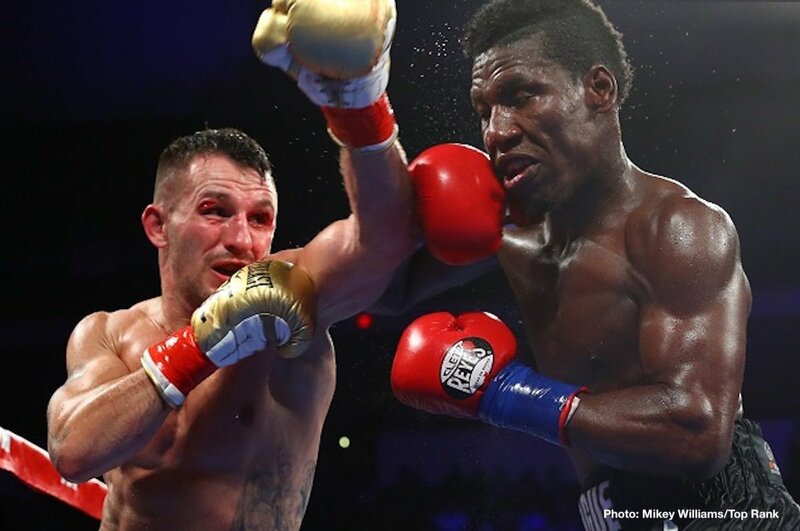 Last night in Fresno, California, unbeaten welterweight contender Egidijus Kavaliauskas won a clear, if somewhat messy, ten-round UD over Jose Carlos Abreu. The Lithuanian won by scores of 96-94 and 97-93, 97-93 and the 30 year old is now 20-0(16). Abreu fell to 21-4-1(19). There was a nasty clash of heads in the opening round with Abreu suffering a cut above his left eye and Kavaliauskas being cut above his right eye. The styles of the two men never really gelled and promoter Bob Arum later criticised the referee for allowing Abreu to hold too much throughout the fight. Kavaliaskas picked up another cut in round-three, when a punch opened a wound above his left eye. Neither man looked good in fact, yet the winner may now get a big chance by way of a shot at reigning WBO welterweight champ and pound-for-pound entrant Terence Crawford. Arum has Kavaliauskas on a short-list for Crawford’s planned October fight. It may prove a pretty tough sell though. Fans want to see Crawford in big, big fights with the very best – a super-fight with IBF welterweight champion and fellow pound-for-pound entrant Errol Spence in particular – and fans may turn their noses up at a Crawford-Kavaliauskas match. For his part, Kavaliauskas insists he is ready for the big names and he would take the shot at Crawford if it comes. We don’t yet know how good the Oxnard-based contender really is, and we didn’t get too many answers last night. Then again, against a negative foe who is more interested in holding than punching, it’s tough for any good fighter to look impressive. Certainly though, Crawford will not have seen anything last night that will have made him feel at all nervous.